No matter how good the label is it can never be as good as something that starts with no label, but subsequently may have one; -that would be your own name. The very best suit you can get is one that is made just for you, which is a “bespoke” suit. However such a suit can be delivered in two ways: a custom-made suit or a tailor-made suit. A custom suit can mean your measurements are taken in one place, but made somewhere else. A tailor-made suit is one that is actually made by a tailor, perhaps with fabric you’ve picked out, to your specifications. Assuming you are using high quality fabric and your tailor is skilled at what he is doing, you can’t get any better than that. A custom suit can be just as good if rigorous standards are met. Your measurements are taken and then the suit is ordered for you. But nothing is more important than where it is made, apart from the material it is made from. If your measurements are taken here and then the suit is made in Shanghai, it isn’t likely to be very good. I have yet to see a really good suit made in China; the fit is wrong, the proportions are off, or the workmanship is poor. The Chinese still don’t know how to make a good suit. The exception is Hong Kong, where suits of the highest quality are custom-made, probably as a result of the British influence. As stated previously, Italian made clothing is consistently superior. However, suits of equal quality are also made in the USA, Canada, Great Britain, and some other European countries. Wherever it is made a custom suit will be made to your exact measurements, and will fit you better than anything you can get off a rack. The same applies to shirts, and of course sports jackets and pants. The down side is the cost, although these items are surprisingly affordable and often less expensive than designer label clothing. Custom shirts particularly compare well to retail prices on ready-made versions. But to the extent the shirt is covered by the suit, the suit is far more important. Another kind of suit could be considered semi-custom, in that it comes from a fashion label, but is tailored and finished for you. These come from some of the high-end brands. Tailored suits will cost more than something off the rack, so you should consider it carefully, like an investment. That is where the classic look comes in. You want it to be something you can wear five or more years from now and still look good. That can be accomplished by avoiding extremes of any kind or the trendiness of the day. You don’t have to go to London to have a fine classic suit made for you. You should be able to find a good tailor in your own location. If not, they will find you. There are men who travel from city to city taking measurements for clothing that is then made elsewhere, i.e. Hong Kong, which can produce a good quality suit for you. But a lot depends on what it’s made of. You should try to buy the very best fabric you can afford for best results. If you’re not familiar with the tailor look at some of their other work, or seek out recommendations. If you need a good suit it is well worth the cost. It is not something you buy that frequently. Another item that you can also find custom-made is a pair of shoes. Here again the best come from Italy, but there are also companies like Johnston & Murphy who make personally customized shoes in the USA, which they will also refurbish for life. Most of their products are now imported- the better ones from Italy, but the very best are American-made. These are more costly, but it is something like a custom suit, that is a long-term investment, and works with something like a pair of classic wing-tips. Clearly not everyone can afford these things, but sometimes if you add up money you’ve spent frivolously or on inferior goods you can come up with the funds. Again these are not just purchases for today, but tomorrow as well. When it comes to the very best of men’s clothing one term towers above all others: Italian. Simply stated, the best garments are designed and made in Italy, and this includes everything from ties down to shoes, at least for men. (The considerations for women’s wear are quite different). So powerful is the allure of an Italian designer name that many stores will often carry cheaper goods made in Asia with an Italian-sounding name, whether real or not. But the important part isn’t even the designer as much as the “Made in Italy” label, (although some high-quality brands will also use facilities in a few other European countries, the U.S. or Canada). That label otherwise remains the most frequent and reliable key to identifying high-quality goods, although as we shall see there are others, especially with regard to particular apparel. At the pinnacle are brands like Gucci, Prada, and Fendi, although the latter two are far more prominent in women’s wear. Fendi is primarily known for men’s ties and watches, while Prada makes excellent sneakers and sunglasses. That is not to say they don’t make everything else, they just aren’t that big of a factor in other parts of the menswear marketplace. Gucci has managed to stay on top for generations with fresh designers like Tom Ford, but it is also one of the most widely knocked-off brands this side of Luis Vuitton. If you find something with their labels unusually cheap, they are almost certainly fakes, and you should be able to discern a qualitative difference. Everything Gucci makes is of the highest quality, and priced accordingly. (One caveat- they tend to be cut tight, so you usually need to go up one size to get the right fit). They do make some occasionally over-the-top items that only really work in Hollywood, and not surprisingly they are more popular on the west coast. But pricing is generally not outrageous for what you’re getting, unlike French luxury brands like Louis Vuitton and Hermes, for which there is no possible justification in terms of content. But with these brands you have to be discriminating. For example, I was visiting some friends recently and literally all of the men other than me had on the same Gucci loafers, or a close imitation of them. These loafers with the metal horsebits have been so overdone that they’ve unfortunately become a cliche. Unless you want to make a statement that is part of a chorus they make plenty of other fine shoes. 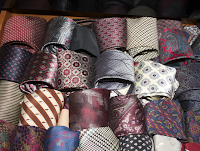 Other Italian firms tend to be specialized and produce the very best of a particular item. The best shirts are hand-made in Italy by Luigi Borelli. The best pants are made by Zanella. They just seem to drape perfectly and come with many small details in construction you won’t find in many other brands. When it comes to suits it’s Brioni. Another distinguishing thing about these companies is that they do not produce any cheap mass-market lines unlike many, if not most other designer brands. That trend was started by Pierre Cardin years ago when he started licensing his name on everything under the sun. (Despite that Pierre Cardin is actually one of those companies that still produces a fairly good mid-range line). Now just about everyone does it on everything from underwear to cologne. (Since hardly anyone wears cologne any more I suspect most of it is purchased as gifts that sit on shelves for years). Even Donald Trump has a line, along with other celebrities, but the only ones that matter should come from bona fide designers. This kind of activity otherwise cheapens the brand and the very best firms avoid it. Even some of the Italians have gotten into the act. Armani has an Armani jeans line and A/X (Armani Exchange) which consists of some pretty mediocre wear for kids. The better Armani stuff comes out in lines like Armani Collezioni these days, though the very best are older which you may occasionally find new, or otherwise used. Dolce and Gabbana is now a kiddy brand like Abercrombie and Fitch, offering little of interest to anyone but gullible teenagers. Many other names like Calvin Klein produce so much cheaper junk that the brand is now meaningless. Gianni Versace was one of the greatest clothing designers who ever lived. He created some truly original stuff that still never managed to be too far out. Unfortunately he was murdered in 1997 and most of the really good stuff was produced up to then. Not surprisingly these items still sell at a premium and/or have been reissued. The brand continues but is not the same and has a Versace Jeans line as well. In good clothing you want originals, so when it comes to jeans you can do a lot worse than Levis. Otherwise you're paying for little more than a designer label and a few embellishments. For that matter designer brands are a total waste of extra money on things like underwear. You won’t really even impress your lady friend with those, should you get that far, but instead will simply signal you are trying to make an impression. The most important and expensive part of your outfit is the suit, or alternatively a combination of blazer and pants. Here again the best Italian firms are unrivaled. The leading maker of top quality suits is Brioni. There is also a less expensive line with the label B.Brioni, but it isn’t the same, and Brioni won’t quite acknowledge whether it is theirs or not. In this case however, these suits are also well-made in Italy and are quite good on their own. They just aren’t the same as the top-of-the line Brioni brand, which can run into thousands of dollars, but you get what you pay for. Leaving even Brioni in the dust price-wise is Kiton, based in Naples, whose suits are worn by many of the world’s elite leaders. Their suits are distinguished by an elegant drape on the body but the prices are beyond the reach of most people, and personally I don’t see all that big a difference from Brioni’s, or for that matter other high quality Italian brands. One of my favorites is Ermenegildo Zegna, which, while carrying premium prices, dollar for dollar probably provides the most value. Canali is an equivalent high-quality brand, and Loro Piana, which is primarily known as the manufacturer of some of the finest fabrics in the world, and a supplier to many of the best brands. Loro Piana fabric is a sure sign of top quality no matter what the brand, and you can often find it in lesser known labels. There are others but all the ones mentioned here are those that I have had first hand experience with. These are brands that have maintained their integrity over the years (most are generations old) by not allowing their name to be purloined on inferior, cheap products. Many, if not most people cannot afford these brands (although there are some ways to get some of them less expensively which I’ll explain subsequently). The point here is that they are benchmarks as to what the best looks like and how it is made, and in that respect no other country in the world comes close to Italy. There are however, many fine mid-level brands made elsewhere we’ll look at subsequently. Question received- What is the proper width for a tie? The answer is directly related to the topic of proportions, which continues here. 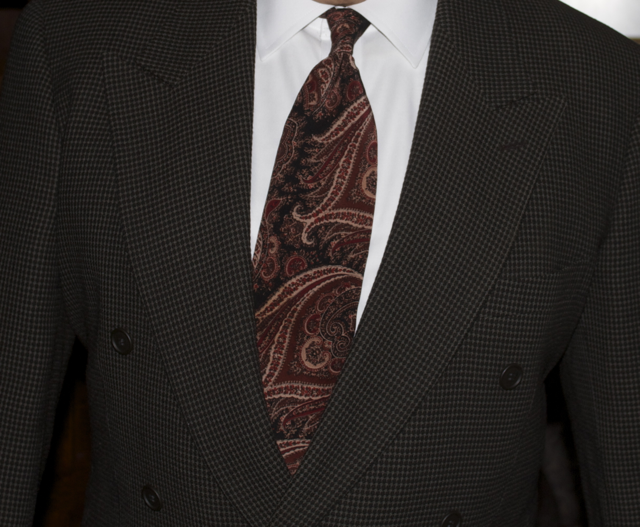 As a general rule tie width should be comparable to the lapel width on a suit jacket. Thus, while the actual width in inches or centimeters matters, what is far more important is that the tie and lapels correspond. A suit with narrow lapels would warrant a skinny tie; with wide lapels a wide tie. However neither extreme is particularly desirable. If there is a magic mean it is 3 inches; that is to say that the tie should virtually never be more than an inch above or below that number. For a classic look the ideal range hovers in fractions above 3 inches to below 4 inches in most cases. The same applies to lapels. Even a lapel that is 3 inches at its widest part is quite narrow overall. I wouldn’t go below that on a jacket if you are going to spend a significant amount of money on it or want to wear it over a long period of time. Generally on a single breasted jacket from 3 to 3-3/4 inches maximum is possible. The only exception is double breasted suits which usually have wider lapels and can go to 5 inches at the edge of a peak. The other aspect of lapels is the notch. There is a trendy move to place the notches virtually on the shoulders these days, which I would avoid. That is going to look as out of place as the notches that were located down in the middle at a sharp angle in years past. Again use common sense and apply the principle of moderation. Further up is okay but not too far up. The notch should be located somewhere parallel to the shoulder seam armpit, but not too far above the seam so that it is still visible from a lower height. The photo below is of a new, current “Joseph” suit from the clothier Joseph A. Bank, which manufactures and sells conservative business suits and other clothing. Notice the lapels are fairly narrow while keeping within classic parameters, but still measure 3 inches at their widest part. In an older suit of a few years ago there would be less territory between the end of the lapel and the shoulder seam, but it could still be worn today without looking out of place. You can see the placement of the lapels is relatively high with the notch facing the end of the shoulder seam. That is about as high as you can safely go and anything more would be too extreme to last. The bottom part of the notch is placed nicely to avoid the vicissitudes of extreme angles. This suit will serve its purpose for many years. If the above is as thin as you should go the image below is as wide as you can go. In a double-breasted suit like that depicted here lapels can be wider and somehow don't look right if they aren't. This type of suit is less common, although personally I favor them, and they don't change much. In this instance the tie is wider to stay proportionate to the lapel width. A thinner tie would not look right with this outfit, which is an older Armani Collezioni jacket. If you were to switch the ties from these two outfits they would not look right, but do show correct proportions as depicted. Thus the basic rule is to wear ties that are proportionate to your lapels, depending on the type and cut of the jacket. 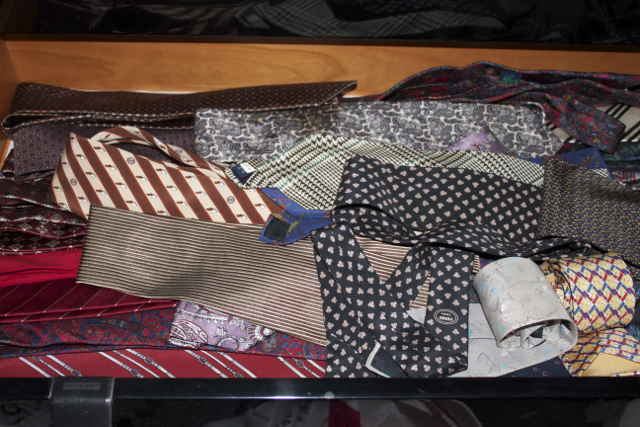 TIP: If your tie drawer looks like this, when you reach for one it will likely have folds and creases because of the way you tossed it into the drawer. The best way to store your ties is to roll them up after you've used them, and keep them in a shallow drawer if you have one. This batch isn't exactly neat, but rolled up like this the ties will be free of unsightly bends and creases. In fact this is also an excellent way to resuscitate a tie that has become bent out of shape. Roll it relatively tightly and you'll be surprised at how well it straightens out after a while.